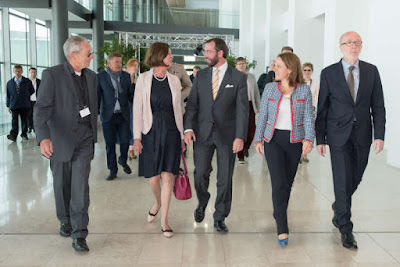 On the 21st, Hereditary Grand Duke Guillaume attended the 11th Congress for the European Association for Mental Health in Intellectual Disability. The event was held at the European Convention Center in the Kirchberg area, and it highlighted creative collaboration among those with intellectual disabilities, along with the need for improved access to mental health services. Additionally, the Congress aimed to focus mental health care more on the individual and the unique needs of each person. Following the session, the Hereditary Grand Duke visited with participants. Another photo at the Cour website.